As indicated in our post in February, we hold the regular Taskforce meetings in a wide range of locations. 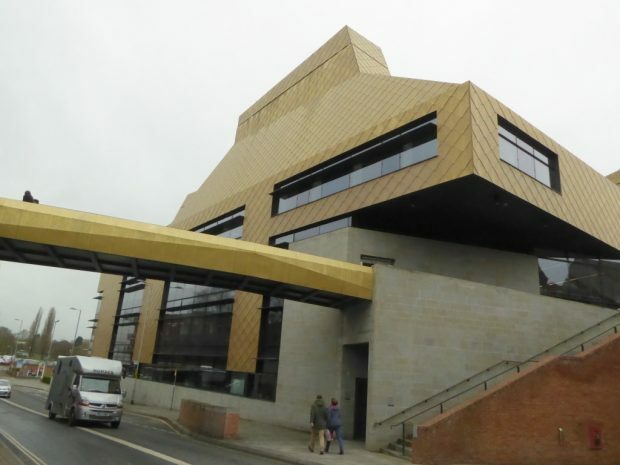 For the 13th meeting, we travelled to Worcester, where our hosts were the team at the Hive - a unique library which is a collaboration between the University of Worcester and Worcestershire County Council. Outside the formal meeting we had a short presentation from, and discussion with, representatives of Worcestershire Libraries and Learning Service. The presentation covered the varied work they were undertaking across the county, the challenges they face, and also the background to the establishment and development of the Hive, the only joint university and public library in England. Across the other 20 libraries in the county, there were numerous different examples of collaboration and co-location with partners, which varied according to community need. Wythall library was a joint provision with the Woodrush Academy, supported by the local community and parish council. 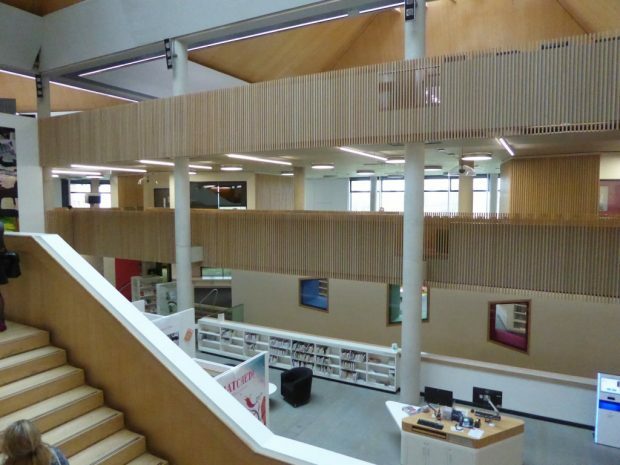 Bewdley has a new library alongside a new local medical centre; and DWP are expanding from their existing co-location with the library in Malvern to do the same in Kidderminster and Redditch. After the formal meeting, we toured all 5 levels of the Hive - a multi award winning building, opened in 2012. We discovered that the distinctive ‘cones’ visible on the roofline form part of the sound dampening mechanism - and sure enough, in the central space there was a steady background noise of people moving around, voices and footsteps echoing, but once you moved into the study areas, it was quiet. Besides the library, the building is home to the Worcestershire Hub - a one stop shop for enquiries about council services, and the Worcestershire archive and archaeology service. The building is sited in a historic part of the city, and below the stairs in the main atrium is evidence of Roman habitation - an excavated Roman oven. In the library, the joint collections are available to both students and members of the public. The programme of events also reflects this collaboration - this season it contains everything from a Mad Muggles workshop for children, to lectures delivered by professors from the University. Because of the shared set up between the University and County Council the Hive is open 7 days a week, between 8.30am-10pm every day. Members of staff are responsible equally for both audiences, and the team challenged us to spot who was officially employed by which service. So if you haven’t been to the Hive yet, I’d certainly recommend it for a visit so you can find out more about their successful relationship with academia. Brian Ashley, Director of Libraries at the Arts Council, then shared an update on work to take forward the Single Library Digital Presence (SLDP). The discussion that followed was broad, and included ideas about developing more visionary thinking about future digital trends and opportunities arising from those, and the increasing tensions between freedom of information and personal data privacy. There were many potential workstreams discussed, and we’ll blog again as plans evolve. We talked about using the convening power of the Taskforce and its members to bring new partners into this area, and covered ways to build on the digital training SCL has already delivered to staff to develop their skills and confidence further. As at the previous meeting, the broad discussion will be distilled into a short set of action points, which will be our means of tracking progress against this Outcome. We’ll publish the formal minutes of the meeting on GOV.UK soon, and turn our attention towards planning the 14th meeting. This is scheduled to take place at the end of May at the premises of another Taskforce partner: the Reading Agency, at the Living Word Centre in Farringdon. At that meeting, we’ll be focusing on Outcome 2 - Increased Reading and Literacy.